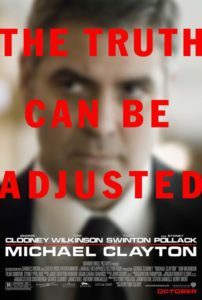 Michael Clayton (George Clooney) is no longer a lawyer. Now he is a ‘fixer’ of sorts. The man who – like The Wolf in Pulp Fiction – can be introduced to a situation and rapidly assess the best course of action, and the best people to carry said actions out. Clayton doesn’t get his hands dirty beyond making introductions and suggestions, but his involvement invariably ensures a swifter and less painless outcome. When former colleague Arthur (Tom Wilkinson) goes off the meds and off the rails, a high profile and pivotal suit against the immense multi-national that Clayton ultimately represents, he is faced with an unenviable choice, sell out his long time friend in a time of need, or risk the wrath of his extremely powerful employer. And with a new CEO Karen (Tilda Swinton) taking particular interest, this might be Clayton’s time to leave an indelible impression. One way or the other. Two parties that Clayton has allegiance with, but the distinct possibility that the can be only one ‘winner’. As he investigates further more truths are unveiled and new facts revealed that move Clayton a little nearer the light, though as the saying goes ‘sometimes the light is an oncoming train’. The cast is excellent. Clooney turns off the smirk for a couple hours and once again proves he is a superior dramatic actor. Tilda Swinton is great regardless of what she is doing, being or saying, and Tom Wilkinson practically steals an unstealable film as Arthur, a pivotal role really given the storyline. I’ve said before that Wilkinson is an actor who plays ‘up’ to a quality script but equally can allow a bad script to have him ‘settle’ for hamming. Rush Hour 2 was settling, Batman Begins was reasonable. Michael Clayton is ‘up’. Michael Clayton is an ‘adult thriller’ in as much as it demands attention, feeds you no easy fixes, and has an extremely low body count. That said, the lack of boom-booms doesn’t detract one iota from the efficiency of what is an excellent, character driven film, and one that is far more plausible than a thousand Jason Bourne type flicks. Not that there isn’t room for Mr Bourne either… Just not enough room set aside for great stuff like this. Final Rating – 8 / 10. What to do when conflicting goals converge?